When it comes to stocking up on cozy knits, we appreciate versatile pieces that will complement our wardrobe. While we might be busy coordinating our closet, there is one item we need to pull your collection altogether, a drop shoulder sweater. A subtle difference from the traditional go-to pick, this design will keep Us stylish and warm all season long. We’re heading over to the Saks Off 5th to shop a cashmere find with a sweet markdown over 70 percent off! After all, who doesn’t love a jaw-dropping deal? See It: Check out the Saks Fifth Avenue Drop Shoulder Cashmere Sweater at Saks Off Fifth for only $65 (a 74% off markdown) while it’s still in stock! The Saks Fifth Avenue Drop Shoulder Cashmere Sweater lives up to the hype. Featuring a rib knit collar and a relaxed silhouette, layering ensembles has never been easier. Crafted with a curved hem and drop shoulders, this design is just what we need for an effortlessly chic look. The ultimate pullover style, this essential will become our favorite in no time. Try this garment in the ebony hue to add a sleek element to ensembles. If we’re looking to add a touch of color to ou outfit, opt for the dark pinot shade that will mix and match with our wardrobe easily. This style is also available in sleet heather and driftwood. Shopping cashmere pieces can typically leave a dent in the wallet, but this budget-friendly number is a nice change. 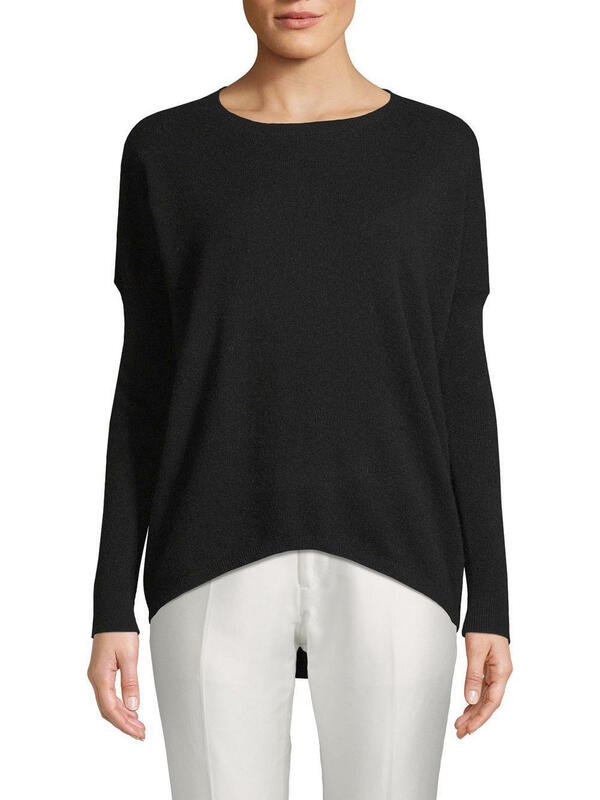 This cashmere sweater is marked down to 74 percent off! Pretty sweet, right? Style this sweater with skinny jeans, over-the-knee boots, a wool cape coat and a tote bag for a fall-approved finish. Lounging at home? Pair with leggings and faux fur bow slides to snuggle up in style. Now is the time to add this fabulous find to your shopping cart! With sizes XS to XL currently available, it is only a matter of time before this design sells out.